Drums & Percussion > DW Collector's Series Exotic PRIVATE RESERVE Waterfall Bubinga Snare 14" x 6.5"
DW Collector's Series Exotic PRIVATE RESERVE Waterfall Bubinga Snare 14" x 6.5"
DW Executive Vice President and drum designer John Good has acquired an 800-year-old, highly figured Waterfall Bubinga log, DW’s latest addition to its highly coveted Private Reserve Series of Exotics finishes. The 8.5-foot diameter find, with a yield of 115,000 square feet of veneer, is a stunning successor to DW’s Private Reserve Series finishes. 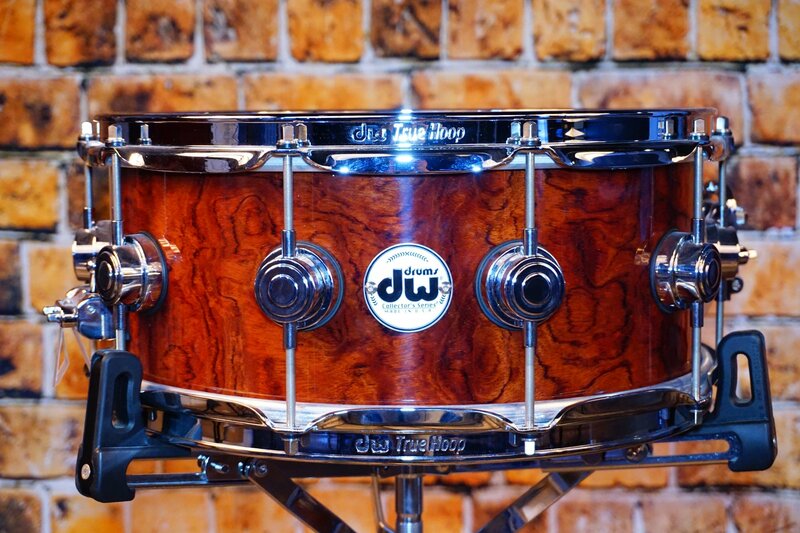 The Collector’s Series Private Reserve Waterfall Bubinga is finished in glossy natural lacquer.